Are We At The Dawn Of A Golden Age Of Comic Book TV Shows? There have been TV shows based on comics for decades, but this is the first time it feels as though the full diversity and strength of comics is getting represented on U.S. television. Why is this happening now, and will these shows actually live up to their source material? There are definitely a ton of shows based on comics on television now or soon. DC Comics alone has Arrow, The Flash, Constantine, Gotham, and the Vertigo adaptations iZombie and Preacher. Marvel has Agents of SHIELD, Agent Carter, and three series coming to Netflix soon. Powers, based on the Brian Bendis series about cops and superheroes, is coming to the Playstation in December. The Strain, the vampire series based on novels as well as comics, is coming this summer. And Syfy is developing a DMZ series. And that's just the ones I can think of off the top of my head. What's amazing about that list is not just that we're getting so many live-action superhero shows, but that we're also getting Preacher and Constantine. That's nuts. The Preacher pilot is being written by Seth Rogen and Evan Goldberg, who may just have enough pull in Hollywood to make the studio stick closely to the comics source material, and aired on AMC, which already proved it can handle tough material. 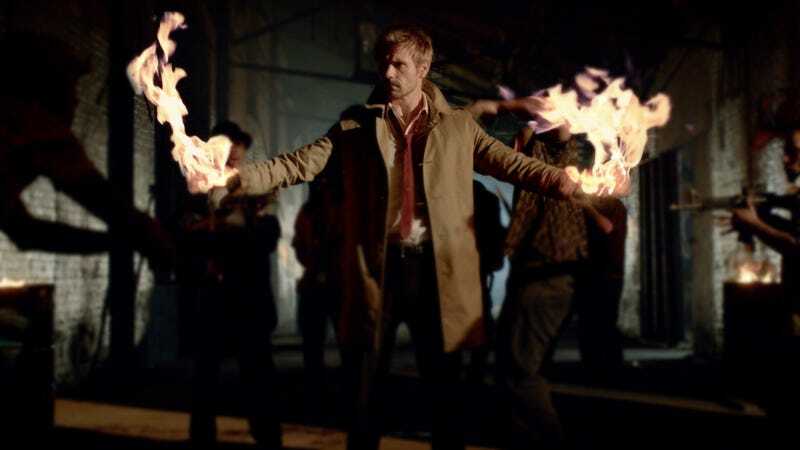 And Neil Marshall is directing the Constantine pilot, which means we're pretty much guaranteed something memorable and insane. There's a great article over in the Observer about this phenomenon, in which I'm quoted — and talking to writer Sarah Hughes about this topic made me think more about what's going on here. So why is this happening? Obviously, Arrow is a hit by The CW's standards. But it's also kind of a proof of concept. It's a show that does superheroics in a way that feels somewhat grounded and semi-realistic, with real drama and character conflict in between all of the fights and plot devices. You watch as much for Diggle and Felicity as for the random costumed fighters. And meanwhile, The Walking Dead might be the most successful comic-book adaptation in television history, and it's achieved that success partly thanks to the close involvement of comics creator Robert Kirkman. Plus The Walking Dead clearly owes a lot to the comics, but isn't about superheroes or costumes. So for the first time, you have a couple of pieces of evidence that comic-book shows can be taken seriously, and also that they don't have to conform to people's expectations of comic-book material. It wasn't that long ago that comics-based TV shows were self-consciously "comic-booky." Even Heroes, which was a pioneer of avoiding costumes in favor of character-based drama, had endless scenes where the characters pored over the Small Wonders comic or debated comic-book lore. The Cape was even more self-referential, with the Cape basing himself on a (made-up) comics character and reading the comics aloud to his kid. No Ordinary Family also winked in superhero clichés, mostly via Michael Chiklis' over-eager comics-quoting sidekick. I'm reminded of the way Ang Lee's Hulk tried too hard to have comics panels on the big screen. Or how Sam Raimi's Spider-Man films seemed to try for a comic-book aesthetic and to duplicate the framing of key comics scenes at times. The proliferation of comic-book movies in the past five years has coincided with a decline of not just campiness, but also self-conscious comic-book imagery. Now, maybe the same thing is happening on television. Arrow is, to some extent, building on the success of Smallville, which also felt grounded and realistic — but Smallville didn't seem to know how to start featuring more of the overt superhero motifs without filling the screen with bright dayglo costumes. Arrow feels somewhat less campy than Smallville, too, just as Smallville was less campy than Lois and Clark and the previous Superboy show. So the main lesson of comics-to-television adaptations seems to be the same as the basic lesson of all genre fare on television: focus on the characters, and keep the fantastical elements relatable and personal, especially at first. Arrow has also proved that you can start out with a pretty basic set-up, and then slowly add more costumes and far-out ideas over time. The other thing that comics-based TV shows are benefiting from: fans have seen these characters and concepts get so abused and distorted, there's a lot more wriggle room. After watching the Constantine movie take huge liberties with the Hellblazer comic, fans will be a lot more willing to forgive the Constantine TV show if it makes a few changes here and there.